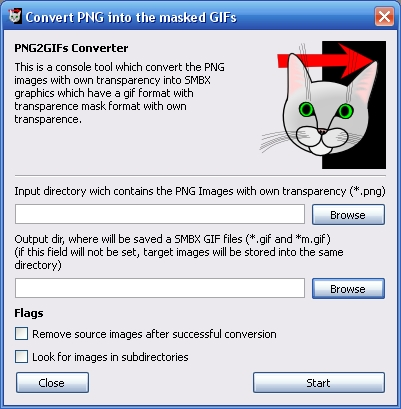 PNG2GIFs - is a converter which create the SMBX64 GIFs pair which using the mask for define transparency from a transparent PNG image. 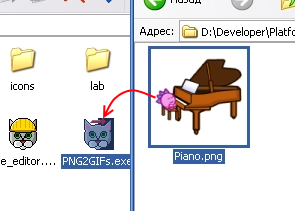 PNG2GIFs - is a console tool, you need open the terminal or command line and change directory to the PNG2GIFs tool. The Editor have a GUI shell for set properties to the PNG2GIFs. For open them, try the menu item: "Tools -> External tools -> Convert PNG into the masked GIFs (PNG2GIFs)"